We all met up in Model Farm road and then a 2nd meeting at the Firgrove in Mitchelstown saw us all car pool to Clydagh bridge where we met up with Mountain meitheal chairman Jimmy Barry and our leader for the day Frank Mc Mahon. We left most cars at the car parks and loaded up tools etc and set off for the Saunders Track which runs from the main track up to Curragh Lake. 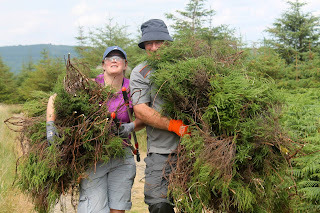 It wasn't long before Frank gave us our instructions and you were seperated out into Light workers which involved 'Brashing' (collecting heather for the underneath part of the track) stripping bark off logs, collecting stones etc or heavy work which included shovelling gravel and carrying. Someone fill this up for me will you! 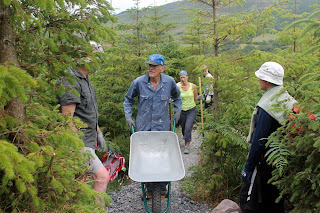 We all tried each of the jobs and frequently swapped around so as we were not under constant pressure so it was nice to see that our health was being looked after and also on board was Robert Gandon of the original Mountain Meitheal up in Wicklow to explain each job to us and the tools we would be using etc and how to use them safely. I would like to say a massive thank you to the following members of Bishopstown hillwalkers who turned up on the day to freely give there time to what is no doubt a very deserving project. Mike Murphy, J.J.Cotter, Josephine Falvey, Imelda McSweeney, Tom McCarthy, Mags Cotter, Noel Murphy, Marie Foster, Trish O'Connor and Deccie O'Connor. Both Jimmy Barry (Chairman) and Frank were very impressed with the work put in by our members and you all did our club proud. Hopefully we will have more work days in the future and other volunteers from the club. As you can see from the picture of the stairs and waterbar etc we put a huge amount of work in and will get great satisfaction from this for many years to come.